Green Drinks - an international phenomenon, an informal gathering of individuals interested in meeting like-minded environmental/ renewable/ sustainable people, think of it as the Green Happy Hour if you will. Check for local gatherings or consider starting one of your own! Omlet - an interesting development from the U.K. which was reported in the New Jersey Star Ledger - urban chickens. Colon club & 2005 calendar!! 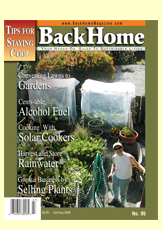 issues 1 - 203 available on the Mother Earth News website - a fantastic resource!